A global double standard on asbestos exists in the 21st century; even as developed nations have banned or seriously restricted its use, demand in some industrializing countries remains strong. A recent analysis of data documenting the global asbestos trade reveals significant trends in output and demand over the last sixty years.1 Included in this article are a number of charts and maps which were produced for presentations by the International Ban Asbestos Secretariat (IBAS) to illustrate the changes which have taken place; they are now available for general use and may be copied from this article or from a new Graphics Page we are developing, where additional formats and higher resolution maps are available. 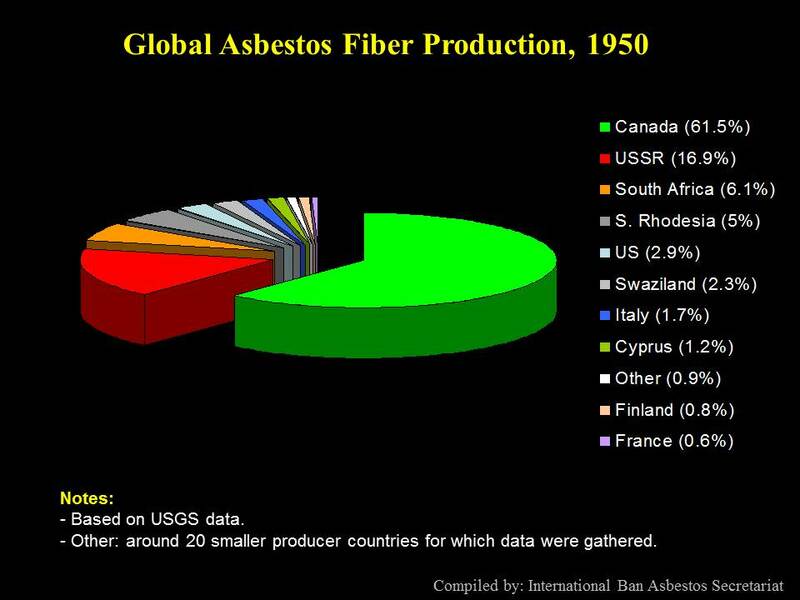 As can be seen from pie charts 1-2, during the middle of the 20th century, Canadian asbestos mines were dominant. In 1950, the top three producing countries accounted for 85% of all output. Within thirty years, however, the situation had changed; although the number of countries mining asbestos remained constant at around thirty, there was an increase in the number of major players. Whereas in 1950 Canada, the USSR and South Africa accounted for 84.5% of all global output, in 1980, 87% of production took place in: the USSR, Canada, South Africa, Southern Rhodesia and China. Perhaps, the most significant difference between pie charts 1 & 2 is the fact that by 1980, Russian output had overtaken Canadian. 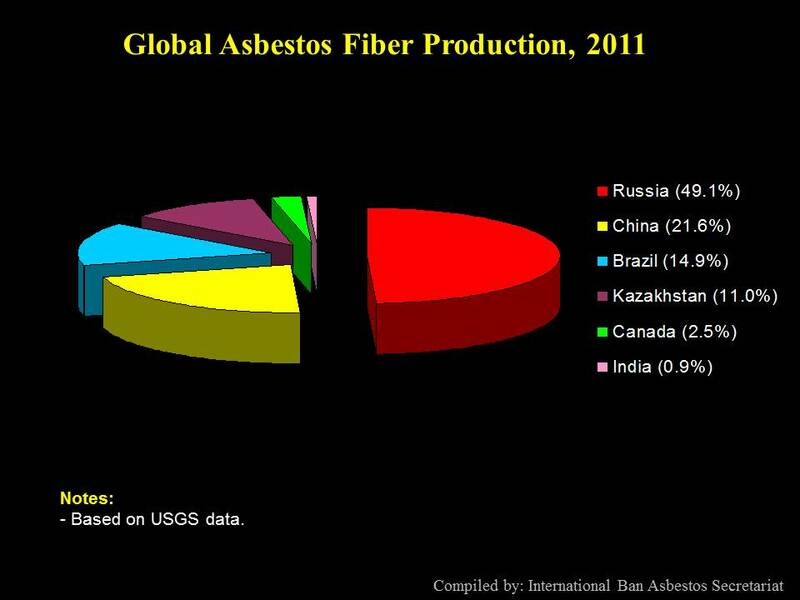 By 2011 (chart 3), production in Canada and most other countries had virtually ceased leaving Russia, China, Kazakhstan and Brazil to fulfil worldwide asbestos demand. 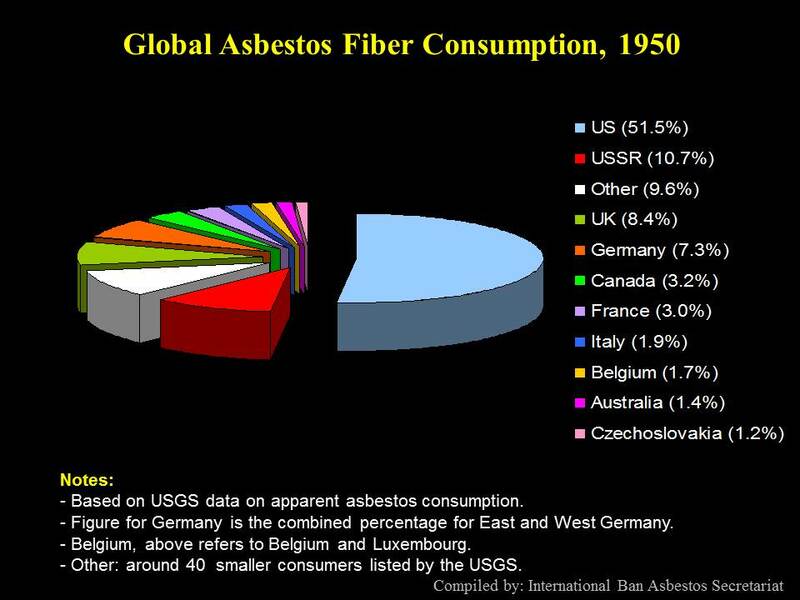 Pie charts 4-5 clearly show the dramatic growth in the number of asbestos-using countries between 1950 and 1980. In the post-World War II period, the U.S. accounted for 51.5% of all consumption; 33.5% of total demand in 1950 came from 45 other nations. 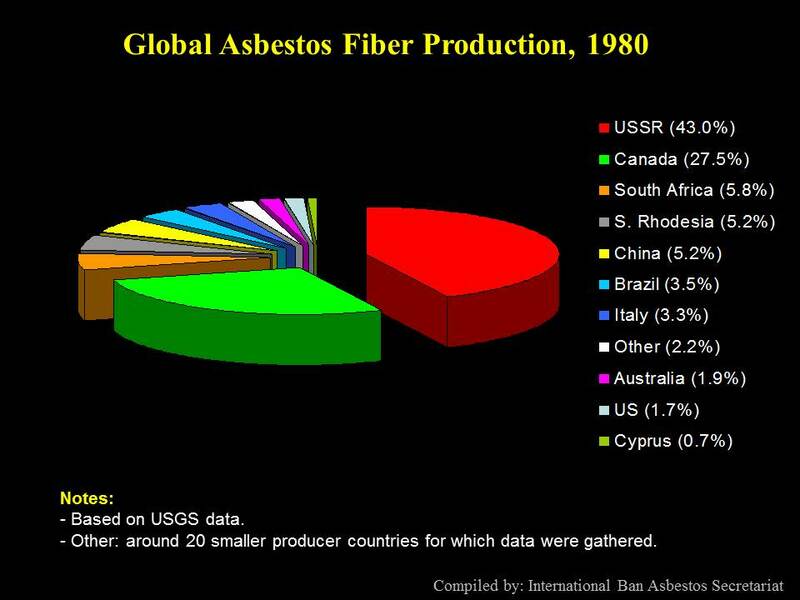 Although the USSR had emerged as the world's biggest asbestos market by 1980, increasing demand was observed in scores of countries. Total worldwide usage almost quadrupled in thirty years from 1,266,929 tonnes in 1950 to 4,728,619 tonnes in 1980. 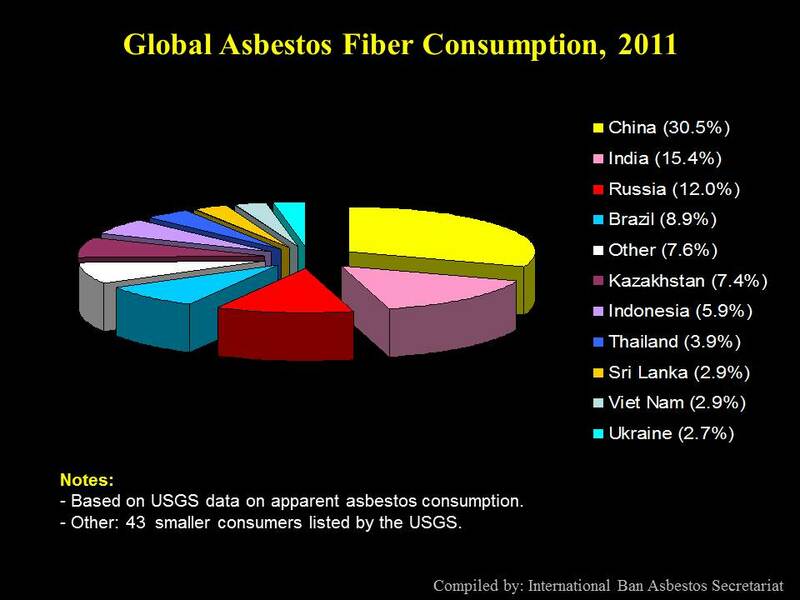 By 2011 (chart 6), Russia had been supplanted by China as the world's biggest asbestos market, with India in second place. 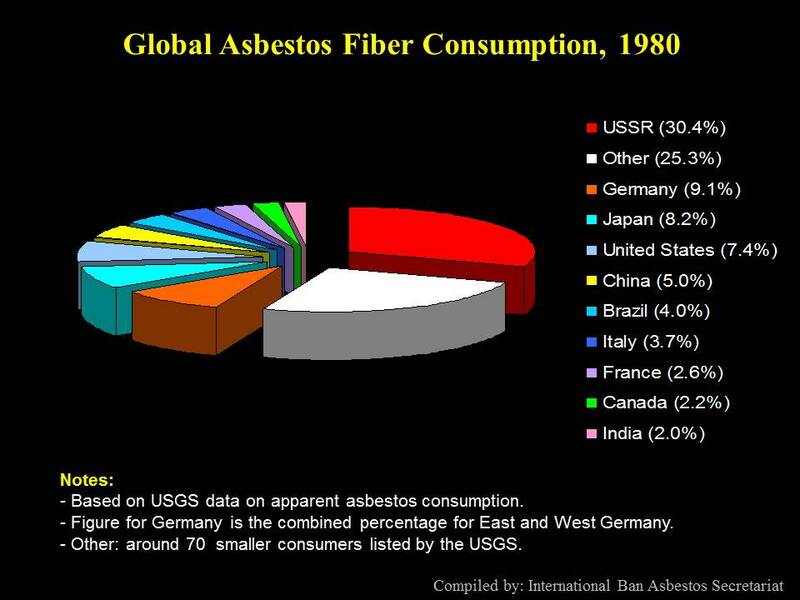 Of the 50 countries accounting for nearly 85% of all use, only 35 consumed more than 500 tonnes of asbestos/year. 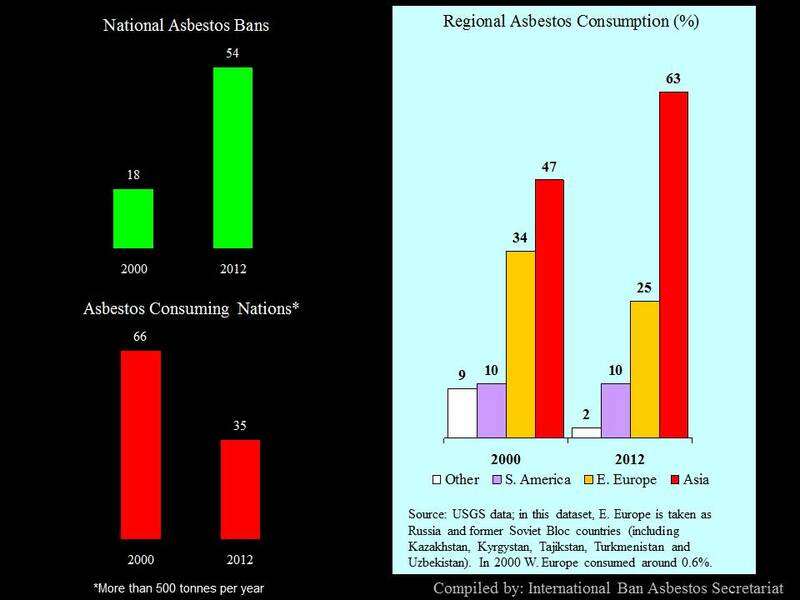 Bar graphs comparing global and regional use in 2000 and 2012 show a trebling of the number of national asbestos bans, a 53% fall in the number of asbestos-consuming countries and the growing importance of Asian asbestos markets. 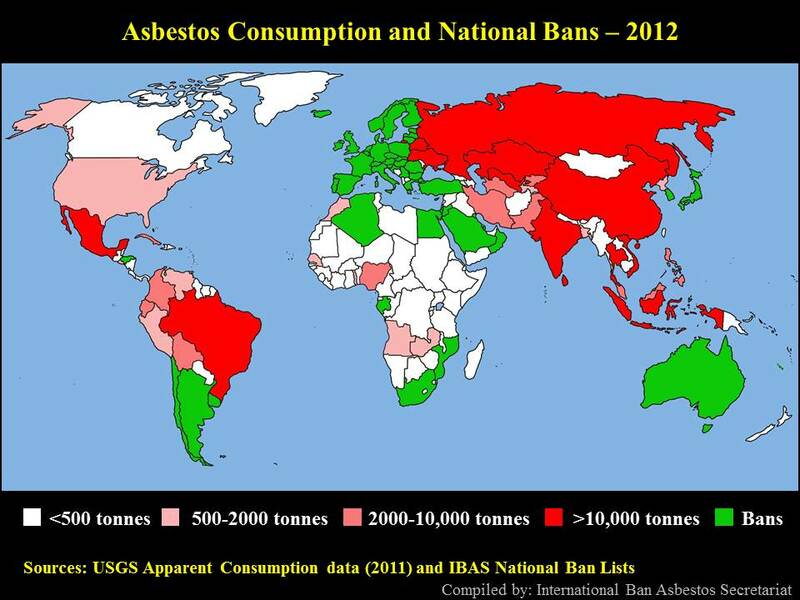 Maps comparing levels of national asbestos consumption and the spread of asbestos bans in 2000 and 2012 are informative. 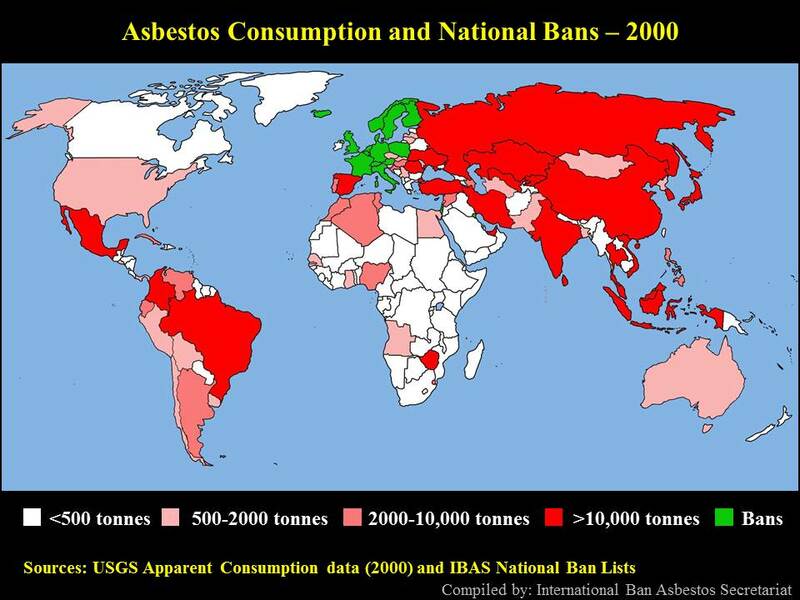 Whereas the earlier image shows just a handful of countries with bans (green), the majority of which were in Europe, the later graphic reveals that asbestos has been banned on six continents.2 The timing of asbestos bans is shown in the table below. In the last ten years, more national bans have been introduced than in the preceding two decades. While it is disappointing that annual demand for asbestos remains at around two million tonnes/year, the fact that markets have disappeared in so many countries is indicative of a significant change in the public's perception of the asbestos hazard. Asbestos, regarded in the mid-20th century as a magic mineral, is now acknowledged to be the world's worst industrial toxin. An asbestos-free future is possible. 1 The asbestos production and consumption data on which the charts in this article are based are obtained from the United States Geological Survey (USGS). In providing the data the USGS point out difficulties in obtaining reliable data from some countries in a timely manner. There are also irregularities resulting from stockpiling which make assessment of asbestos consumption by nations which are also producers problematic. However, for the purposes of the charts we have used the annual data as is with no attempt to correct for such factors. 2 While, as of 2013, there are no asbestos bans in 9 of the 10 countries sharing mainland continental North America, Honduras banned asbestos in 2004.